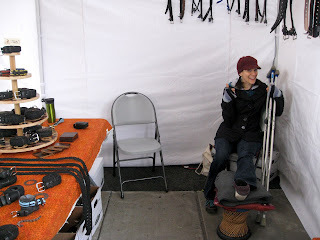 This weekend's Saturday Market went very well. It was better than I expected, and about equal to what I was hoping. Saturday's great weather definitely helped - it was sunny and in the 60's. The waterfront was packed full of people happy to get out and enjoy the weather, and they were excited about the reopening of the market for the season. Sunday was overcast and not as warm, but it was still rather busy. Karen had sprained her ankle on Thursday bouldering at the rock gym, but she still came out for moral support. 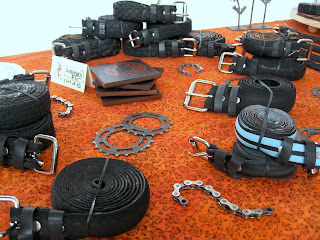 I think I may have sold some belts due to the pity factor. 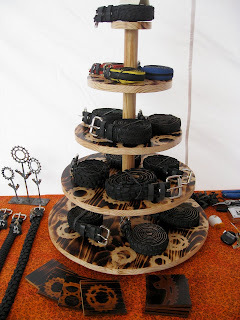 Luckily I don't have too much stuff or an elaborate display yet, so it didn't take me long to set up. The cupcake tray from the wedding lives again. 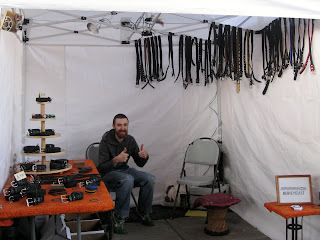 I had a lot of fun, and sold about 20 belts overall. My booth neighbors were all pretty awesome. The crowd is great, I met some interesting people, and handed out a lot of business cards. The half priced Rogue ale at the end of Sunday was excellent too, which could be the start of a weekly tradition.